Once you have finished developing your agent, it is important to test it to ensure the correct data is being extracted and in the format you require. 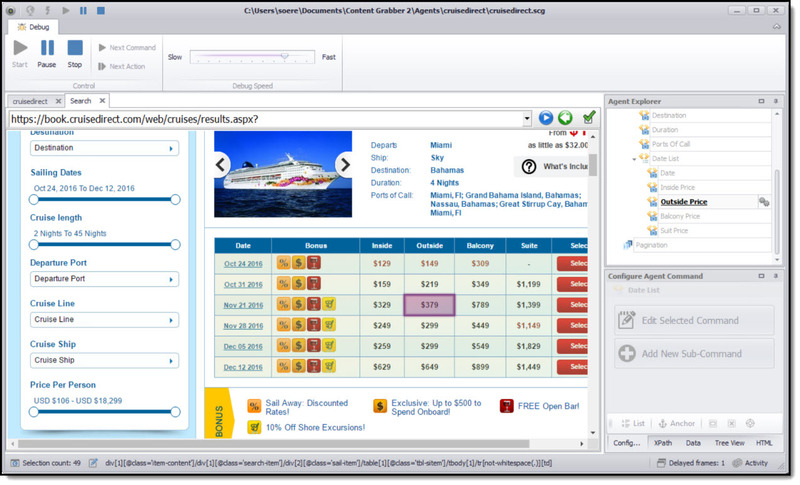 Content Grabber has a sophisticated debugging engine which enables you to carefully analyze all aspects of your agent and the data being extracted. It can also help you to pin-point any trouble spots in your agent code so you can quickly resolve them. For more detail on the Debugger features available in Content Grabber refer to Testing/Debugging an Agent. Now let's run the Cruise Direct agent to check the commands are working properly. To do the test run, click the ‘Debug’ menu option at the top left of the screen and then the click ‘Start’ arrow button to start the debugging. During the debugging, we can observe and check that Content Grabber goes through each of the commands in sequence and processes each of the web pages to extract the required data. Part way through running the agent, we will click the ‘Stop’ button to stop the debugging. Then click ‘View Export Data’ to check the output results are correct. To see the export data in Excel, we can simply click on the ‘Open Exported Spreadsheet’ button to open the Excel spreadsheet. 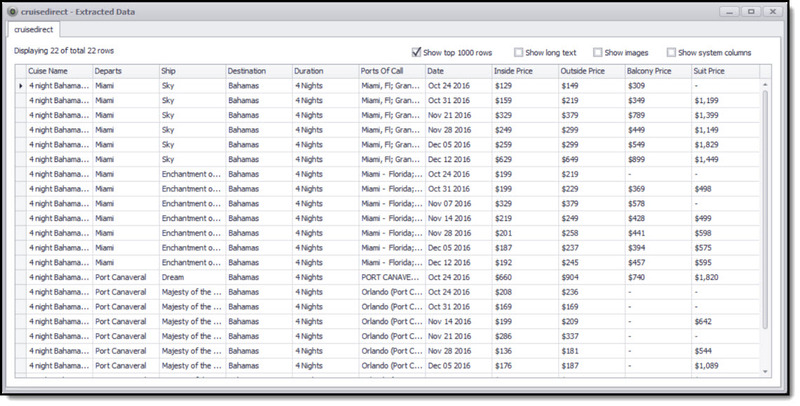 The extracted data contains one row for each departure date, but you could also chose to save the date and price information in a separate data table. The data would then look like the image below when exported to Excel. In the next section, Scheduling you will learn how to set up an agent so it can be automatically run at intervals of your choosing.